Pitso Mosimane is confident that Hlompho Kekana and Tiyani Mabunda will slot seamlessly into the Bafana midfield in the absence of Dean Furman and Kamohelo Mokotjo. 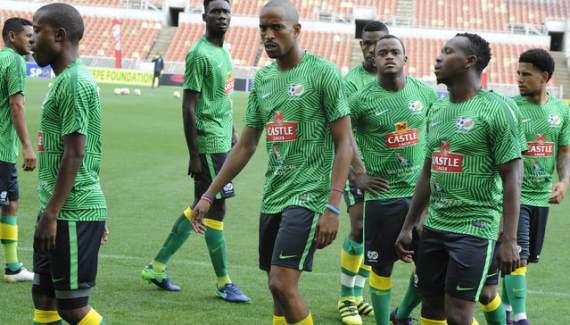 The Mamelodi Sundowns duo could start for South Africa in their Africa Cup of Nations qualifier against Nigeria on Saturday, with Fuhrman and Mokotjo both out injured. Other midfielder options include Thulani Serero, Fortune Makaringe and Teboho Mokoena. Mosimane feels that the pairing of teammates Kekana and Mabunda will reap rewards for Bafana, telling the Sowetan: "I think we've got good players in those positions at Bafana. Fuhrman, [Bongani] Zungu, Kamo, Andile [Jali] are out. We had a lot, but now it's getting [thin in that department]. "Now you have Mabunda and Kekana. They've got the experience to play against Nigeria, no excuse. I mean, they've played in the CAF Champions League." Mosimane added that the pair have experience of playing in hostile conditions. He explained: "You've gone to [TP] Mazembe and you have a problem to play here at home? No, I mean really. "They played against Barcelona [in a friendly], so they've got no excuse."